The Isabella Conservation District is hosting two dates for Household Hazardous Waste/Clean Sweep Collection and two dates for Tire Recycling in 2018. These event are open to all residents of Isabella County. 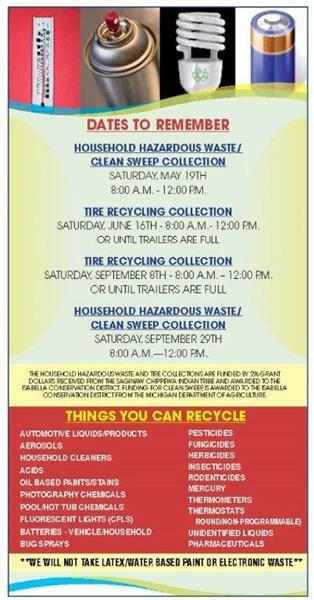 Household Hazardous Waste/Clean Sweep Collection dates are Saturday May 19th and Saturday September 29th. Dates for Tire Recycling are Saturday June 16th and Saturday September 8th. All collections run from 9:00AM to 12:00PM (Noon) and take place at the Isabella County Fairgrounds (500 N. Mission Rd, Mt. Pleasant). Tire collection may end early if the collection trailers are full before 12:00PM. Items that are accepted during collection are listed below. For further questions please call the Isabella Conservation District at 989-772-5927 ext. 3 or visit our offices at 5979 E. Broadway, Mt. Pleasant during normal business hours. Please note that we cannot accept items early - we do not have a facility to store these items until collection.